SHERYL USED TO have a '94 Toyota Camry. She gave it to her nephew a few years ago, and the darned thing is still running. It will have to be humanely destroyed and buried in the infield for it to die. We've been a one-vehicle family for a long time. A month ago I finally bought a used Pontiac Grand Prix to zip around town. As you read last week, it was hit by another vehicle while parked on Maine Street, and eventually declared a total loss. Angus likes the new ride too! It wasn't a fun experience, but I will say the driver of the other vehicle was apologetic and it was an accident, nothing more. His insurance company was decent to deal with and we ended up with a good settlement. We are still waiting for the check because the title from the Pontiac still hasn't arrived from the good old state of Illinois, but hopefully it gets here soon. Sheryl started searching for another car. We thought about getting another Jeep but it was too expensive for something decent. Yesterday we were trying to find a solution to our problem and Sheryl suggested we switch it up and try finding a vehicle for her. She doesn't need to haul anything but the dogs. It might be easier to find something if our criteria were simpler. She called our friend Brad Mintle, who sold us the Jeep. 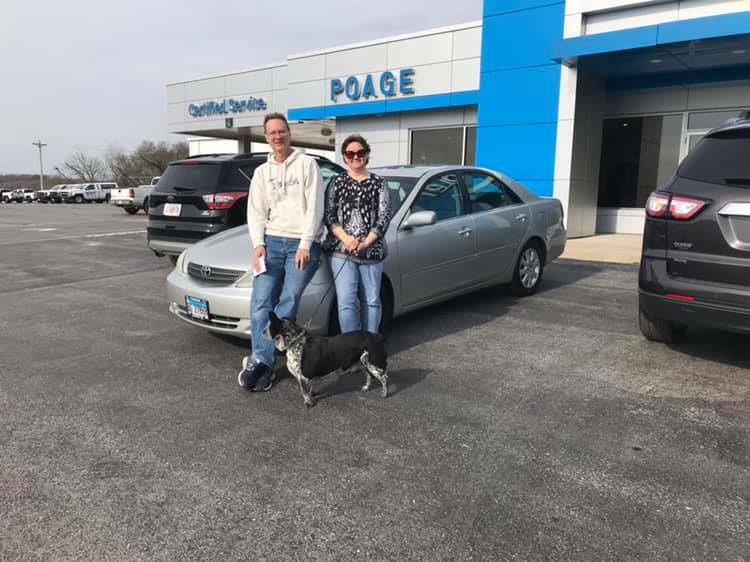 He started working for Poage in Hannibal about a month ago and he came up with a couple of great options. This morning we went down there and picked up our new (to us) Toyota Camry. I'll drive the Jeep since it fits all my gig stuff, and Sheryl is really happy with her new ride. Brad, Lonnie and the people at Poage were awesome and we are finally ready to put our vehicle woes behind us. Don't knock on that piece of wood, please.